RUSSELLVILLE, Ark. 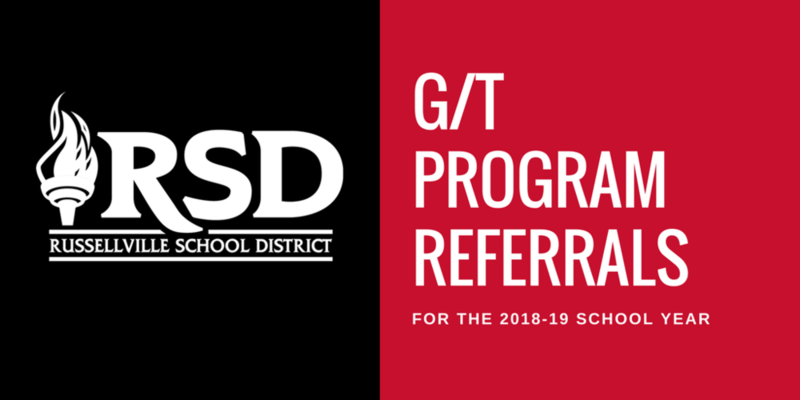 (April 6, 2018) —Russellville School District is now accepting referrals for student placement in the Gifted and Talented (G/T) Program for the 2018-2019 school year. The G/T program is designed to serve high potential/high performing students who demonstrate above average intellectual ability, high task commitment, and above average creativity. If you have a 2nd-11th-grade student you feel should be considered for placement in this program, you may pick up a referral form from any Russellville elementary school office or the GT/AP Office at Russellville High School. The completed form must be returned to your child's school by Friday, April 13, 2018. For additional information call Dana Sumter, GT/AP Coordinator, at 479.968.3106 or email dana.sumter@russellvilleschools.net.